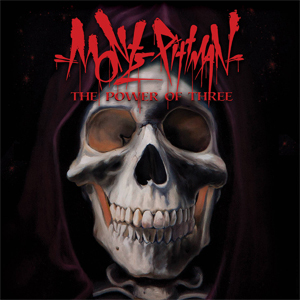 The Power of Three, the upcoming full-length album from award winning, chart topping guitarist Monte Pittman is set for release on January 21, 2014 through Metal Blade Records. Pittman, along with band members Kane Ritchotte on drums and Max Whipple on bass, went to Copenhagen earlier this year to record the album with producer Flemming Rasmussen. "A Dark Horse", the first single from Monte's third album, reflects Monte's return to his metal roots while demonstrating his Orange gear sound and tone to perfection. Flemming Rasmussen, famous for METALLICA's seminal album Master Of Puppets, produced the album The Power Of Three, which is hard and heavy and follows on from Monte's second album Pain, Love & Destiny, which reached number one in both the rock and pop charts. Artist Cam Rackam created the artwork for the cover of The Power of Three. The piece features a portrait of Charon, the ferryman of Hades who carries souls of the newly deceased across the rivers Styx and Acheron that divided the world of the living from the world of the dead. This represents Monte's musical journey from what he has done before and where he is now with The Power of Three and beyond. Monte Pittman has released a brand new single on iTunes! Fans can check out "Before the Mourning Son" now HERE. The cover image for the single is a still taken from Monte Pittman's recent music video shoot for the same track. The video is currently being completed and a trailer is available now HERE. The first single, "A Dark Horse", is also available now as an iTunes single HERE and features artwork created by Gustav Klimt (used with kind permission) titled 'The Golden Knight (Life Is A Struggle)'. It is a textured, symbolic painting which tells a similar story as the music does.